Original location of the ZG Cabin. For a listing of past conventions, click here. Come to Payson for the 25th Anniversary of the ZGWS in 2007! For our 2007 convention, we will be returning to the location of Grey's Arizona cabin. This will be the third time our convention is held here. This will give the society the opportunity to celebrate with the city of Payson for the recent opening of the recreated Zane Grey cabin. 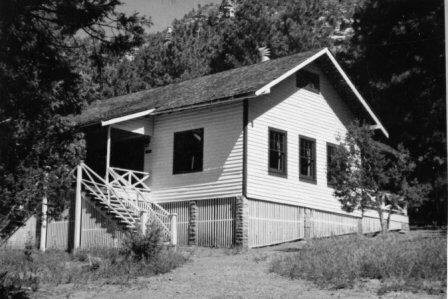 Many of you know that the original cabin was destroyed in the Dude Fire of 1990, but thanks to the efforts of the Zane Grey Cabin Foundation, the Rim County Museum, the city of Payson, and many others, a recreated cabin has been built within the city limits of Payson at the site of the Rim Country Museum. In addition, this is the 25th Anniversary celebration of the Society. If you have never attended a convention, but always thought you should, this is the convention for you! Monday, June 18 Afternoon Check-in. Tuesday, June 19 Morning (early) Member's Memorial Breakfast. Afternoon Annual Auction (bring your material!). Special day trip to Winslow, AZ. See the La Posada Hotel (and learn about the Harvey Girls) and drive through the location of Sunset Pass. Friday, June 22 Morning Check-out. Leave for After Convention Trip (Kayenta), if participating. In addition, there will be jeep rides to Payson's own mini Grand Canyon Sunday afternoon and Thursday afternoon. Contact Conrad if you want more details. Accommodations at the Best Western Payson. Look for details later in early 2007. Look for details later in January, 2007. Wait to make your reservations until we provide details, as we will be able to get you a special convention based rate.